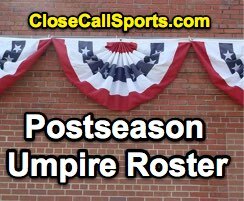 The 2018 American and National League (AL/NL) League Championship Series (ALCS/NLCS) umpire roster is as follows, sorted by round and crew assignment. UEFL Replay Review Ranking (Review Affirmation Percentage [RAP]) is indicated by the number in parentheses. Replay Assistant, American and National League Championship Series: Paul Nauert (43). -cc denotes Game/Series Crew Chief, * denotes regular season crew chief, ^1st^ denotes first postseason assignment, '1st LCS' denotes first League Championship Series assignment. -wc denotes an appearance during the 2018 Wild Card Game round. Pursuant to UEFL Rule 4-3-c, umpires selected to appear in the League Championship Series, including the Replay Officials who substitute onto and off the crew for part of the series. receive three bonus points for this appearance. Postseason crew chiefs receive an additional bonus point.